In recent Study, The popular website “theguardian” said that Delhi, Patna, Gwalior, Raipur, Lucknow are the most polluted cities in the world. Out of top 10 polluted cities 5 are having worse air quality in India, which is very shocking for Indian citizens. We know that air exists since our birth, that it has ample supply, and is also used by other living beings for breathing. Air is a mixture of different gases, some of which are oxygen (O2) and carbon dioxide (CO2). Do we ever think about the quality of air that surrounds us all the time? Perhaps not. Is it important? The answer is YES! The quality of the air we breathe luxuriously determines the quality of our health and wellbeing too! 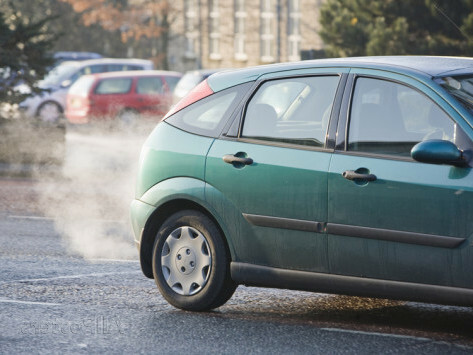 Polluted air can cause respiratory illnesses, trigger asthma and other health problems. So, what are the common sources of air pollution? Learn More about Indoor plants that clean the air and remove toxins. In the industrial world, air pollutants are released mainly from industrial smoke, vehicular exhausts and burning of fossil fuels. These activities increase the concentration of sulphur oxides (SOx), nitrogen oxides (NOx), carbon monoxide, carbon dioxide and methane in air. Heavy blanket of pollution-causing gases trap the heat and make a place warmer, a concept known as Global Warming. Polluted cities can be spotted from the presence/ extent of smog levels. Smog (smoke + fog) arises due to a combination of polluted gases from industries and other sources, and fog. It reduces the visibility greatly and increases atmospheric temperature. What are the polluted Indian cities? Is the city you live in, among them? On February 22, 2016 NDTV India recorded that according to WHO (World Health Organisation), the pollution levels of India has increased more than China and India comprises 13 of 20 most polluted cities in the world. NDTV India also added Greenpeace’s report that the National Air Quality Index (NAQI) (helps to measure the air quality) in India has exceeded the prescribed standards in many cities. Delhi, Ghaziabad, Raipur, Kanpur, Allahabad and Ludhiana are among the highly polluted Indian cities, as per Indian Express’s findings on January 3, 2016. Experts air quality in India. Learn ways to reduce air pollution from factories. What is causing so much air pollution in India? Besides the common sources of air pollution, other causes are: large number of cars, less greenery, poor public transport, less use of bicycles, burning of garbage and/ or plastic, burning of coal, traffic congestion and lack of maintenance of by industries. As a result of these, the concentration of particulate matter (PM) which is another air pollutant, has risen exceedingly. 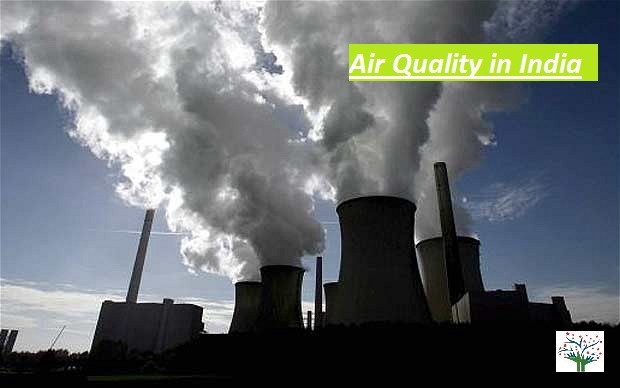 Read more about Sources of air Quality degradation. In recent years due to increase in industries and residential areas, vehicles pollution level is increasing continuously. Geographically India is very diverse, with landscape ranging from snow-capped mountain ranges to deserts, plains, hills and plateaus. Because of that pollution levels are not equal in all locations. It is observed that, pollution always remains high where density of population & industries are high. There are certain states and cities in India where pollution is always on higher side as compared to yearly average. 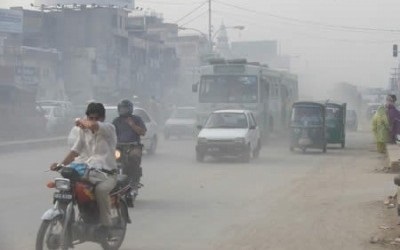 Cities from northern India are believed to be most polluted cities in India as per pollution level Statistics in India. 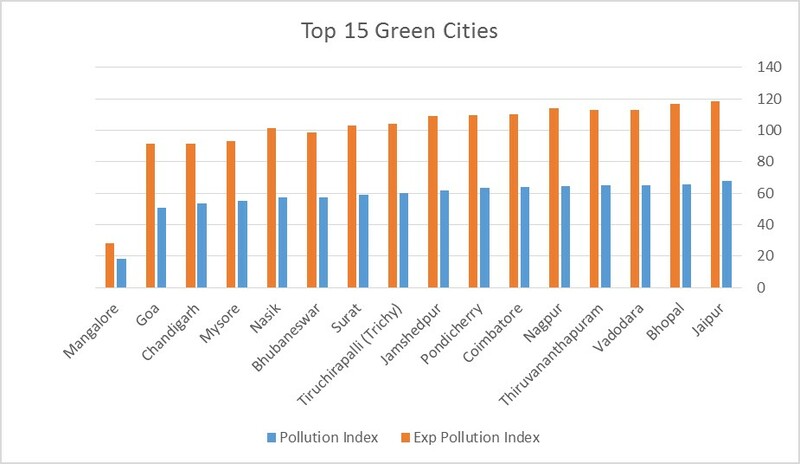 Below is the list of green cities i.e. 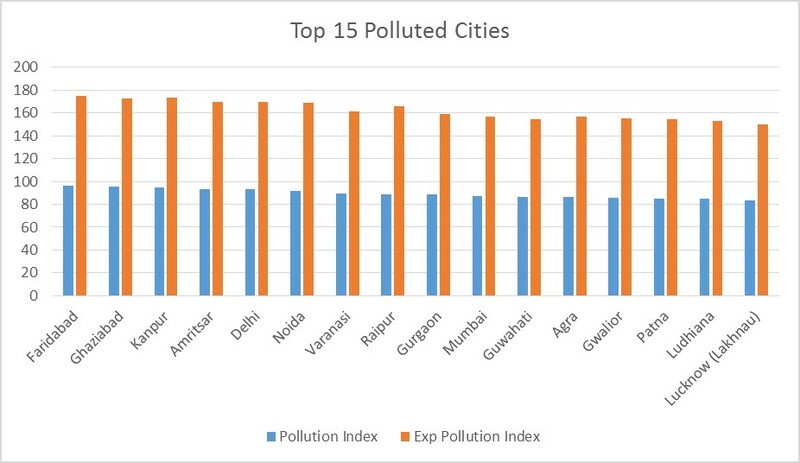 Where pollution level is comparatively minimum to other cities as per pollution level statistics in India. Cities like Mangalore, Goa, Chandigarh, Mysore & Bhubaneshwar topped the list as per recent study for air quality in india. Recently in India many online or continuous air quality monitoring instruments are installed so that we can monitor air quality for major cities in real-time. Till date there are 43 continuous air quality monitoring stations are installed covering 20 cities. and Pb) and that data can be sent to central server in real time for air quality in India. 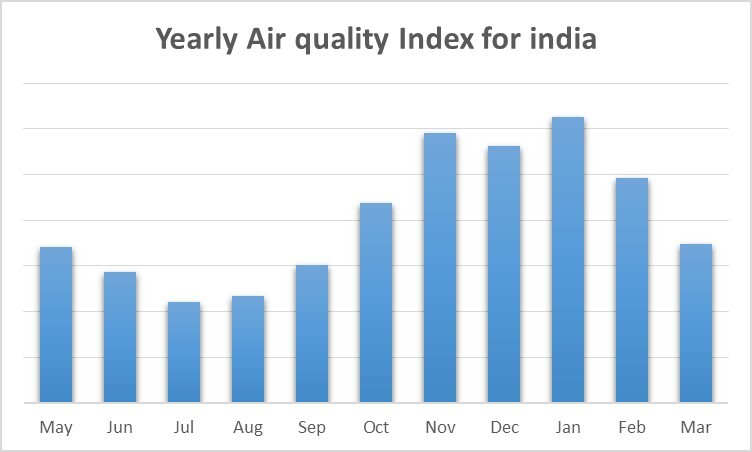 Below are some interesting stats came to notice that majorly in India that high air pollution is observed in duration November to February i.e. in winter. Major reason for increase pollution levels in winters are wind patterns and Low temperatures which aggravates pollution especially in particulate matters PM2.5 & PM10. Environmental awareness in India exists, but it is in need of further promotion. Events such as burning of wastes and plastics can be prevented by spreading awareness about air pollution, its causes and impacts to the public and government workers who clean streets and handle garbage for example. Government has released public awareness advertisements which are shown on televisions and public platforms such as cinema halls. The Delhi odd-even rule was an example of activities implemented by the government in its efforts to curb pollution levels in every Indian city, not just Delhi. To maintain a healthy air quality in India, it must be regularly monitored for air pollutants along with increased level of environmental awareness and implementation of appropriate action plans. Read More about article from theguardian about most polluted cities in the world.